"It is foolish to fear that which you cannot avoid"
After a long hiatus comes Simbu's much awaited movie. He may have been on the lookout for all the wrong reasons but he has come with a bang. This movie though may not be the best of his performances nor a super dooper flick but the crew has done every justice to the film given their limited space. The film's about how a common man like Simbu tries to get a name, longs to a make a mark in a world that he lives in. He has a very simple life, a few simple breakups and not much of a violent history. All he wants to do is go on a bike trip with his first love - Royal Enfield, come back rejuvenated and start afresh. This road trip is what forms the rest of the plot. The movie sends out a message that anything can happen in any simple common man's life. There should be no scope for fear and that man should always be prepared to face whatever life throws at him no matter how confusing. Simbu's acting is noteworthy. Personally not and never a big fan of him but I liked his expressions - decent romances, the caring brother, the guilty son and respectful lover. He portrays them all with elan. Manjima has a credit worthy role for her debut in Tamil. Not to mention the music director received larger share of hooting and screams from the crowd. 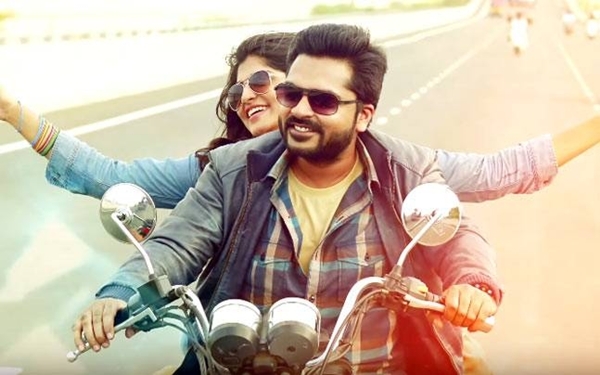 The much awaited Thalli Pogathey did not lose its charm, with people vouching for it throughout. The quick pace at which this song was filmed is pretty evident but all manageable. Contrary to the majority I liked the second part more as it kept me wondering "Why the hell is their life being torn apart? ", "What the hell is happening?" On the whole a one time watch movie. You definitely can enjoy it. Bear the second part it is not as bad as they say. Draggy but yet you will crave to know more. No review for the music as it is by the Maestro himself. Mouth sealed on that. Commendable acting by the lead and ofcourse Dancer Satish who effortlessly plays that flirtatious boy whom you will pity at one point for sure. Fun! Thanks for sharing this review! Interesting story plot, meaningful as well. I am waiting for the movie to be screened over here soon.